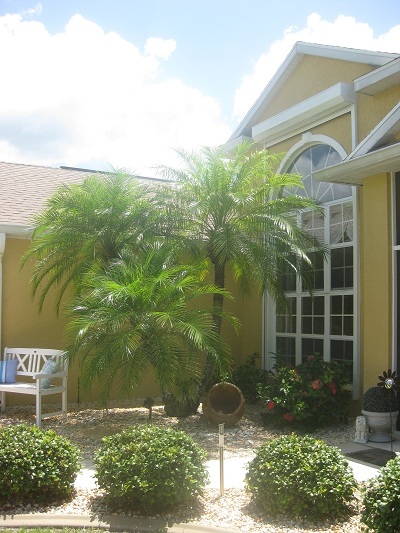 Welcome to our vacation home "Breezy Palms"
Our unique pool home is located on a wonderful creek in Rotonda West, the quiet, friendly golfing community, only seven minutes away from the great beaches at the Gulf of Mexico and close to restaurants and shops. It offers spectacular views to the long creek, is embedded in a gorgeous (10.000 squarefeet) tropical garden and is tastefully furnished with wonderful tropical accents. Our fantastic creek front home offers lots of entertainment space (1707 squarefeet under air condition) to enjoy your Sunshine State vacation. It is luxuriously furnished, lovely decorated, with porcelaine tiles and hardwood floors throughout the house, restful, quiet and safe: a pleasant stay for 2 - 4 persons, perfect for „snowbirds“ who want to enjoy the sun instead of the cold winter. During the whole stay, our home management guarantees taking good care of you. Cold drinks and a fruit basket will welcome your arrival. 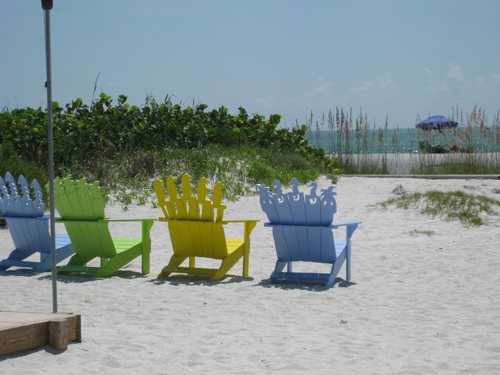 Rotonda West is a peaceful community situated near the beautiful Gulf of Mexico in Southwest Florida. 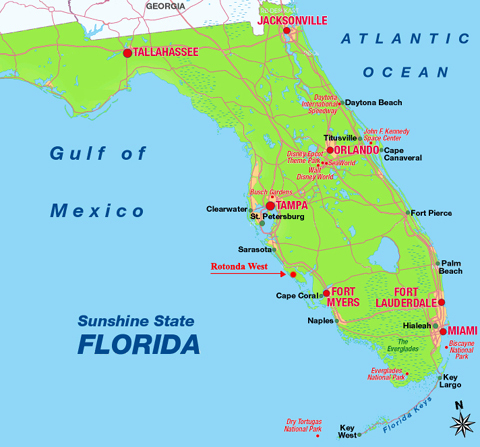 It is located mid-way between Sarasota and Fort Myers. 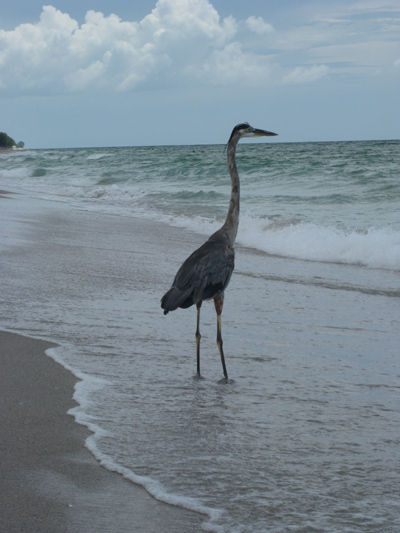 where pelicans fly overhead and dolphins swim in the sea – manatees, dozens of species of waterbirds, sea and land turtles – nature is the key. 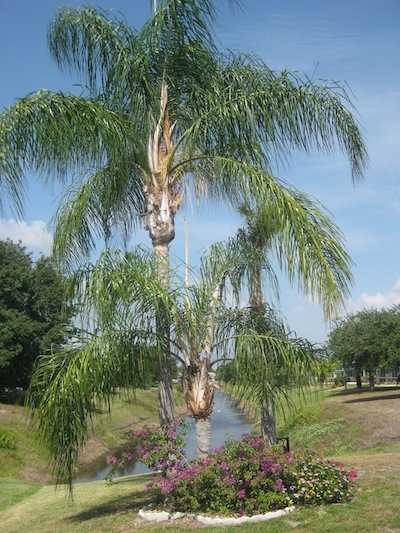 Many golf courses, tennis courts, 30 miles of picturesque canals, lakes and ponds wind through Rotonda West. 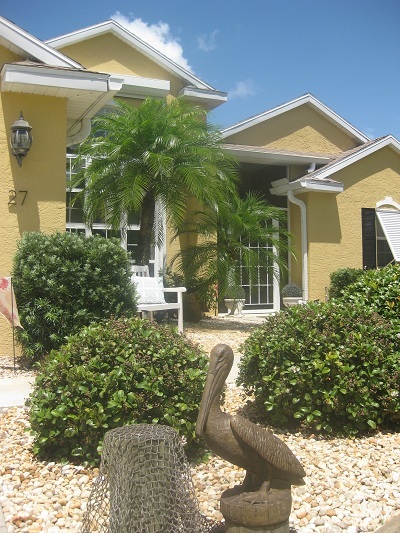 Many exotic and beautiful birds call Rotonda West home, as it is a designated bird sanctuary. „Tiki huts“ next to the bay, over the many great steak houses to the wonderful seafood-restaurants – the diversity is huge. This all can be reached in only a few minutes from our villa. The climate is very pleasant and balanced. 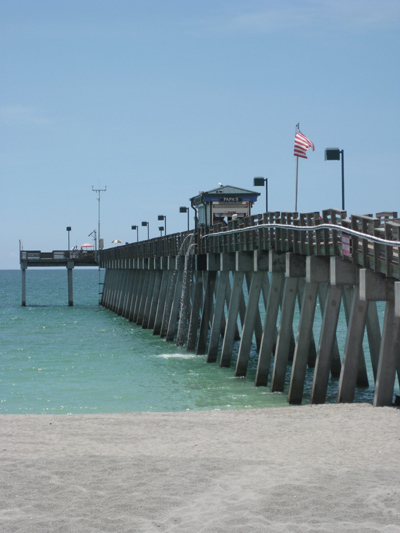 During the summer months, there is always a pleasant breeze due to the proximity to the Gulf of Mexico (average temperature: in the low 90´s Fahrenheit). The winters are warm (average temperature: in the 70´s Fahrenheit).